I am starting to keep pace with the digital age and have begun to digitalize all my pics that were taken before digital cameras. It doesn’t seem possible that when I moved to Utah 8 years ago digital cameras were still minimally used…ah well. This is one of my fave pics of my dad. 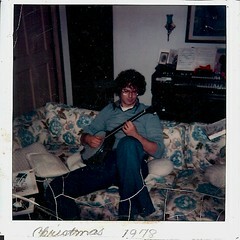 I don’t remember this Christmas, being only 2 at the time, but love the bell bottoms, the banjo, the whole thing. I have added pics to family photos, friends and added some new sets. Take a gander.